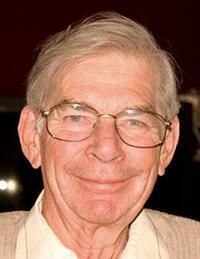 Peter Cross, a founding member and long-time officer of the AHS Arizona Chapter, passed away on October 2, 2008. He was born on October 22, 1927 in Bromwich, Staffordshire England and attended DeHavilland Technical School in 1944. Peter had a long and successful career in design in the aerospace industry working at DeHavilland, Canadair, Boeing Vertol, Bell Aerospace, Enstrom before coming to Hughes Helicopters at the launch of the Apache "A" model production. As Mesa Engineering Manager, his primary efforts were to staff up and train a new group of engineers to support the Apache production line, ramping up from one aircraft per month in 1984 to 14 per month in 1986. Mr. Cross had a passion for mechanical assemblies and flight controls. His last project was to lead a design team to develop replacement of the Shear Pin Actuated Decoupler (SPADS) in the Apache flight control system with an improved Automatic Roller Detent Decoupler (ARDS), a new design now flying in all Apache helicopters. To optimize the design, he built mock-up part for the system in his garage at home.